Abstract: Airwheel has made some breakthrough on the design of A3, which is the addition of a soft saddle to the scooter. With the saddle, riders don’t have to keep standing during the ride. The day of June 18, 2005, a significant day for all the staff of Airwheel, witnessed a milestone for the development of Airwheel and its scooter sector. 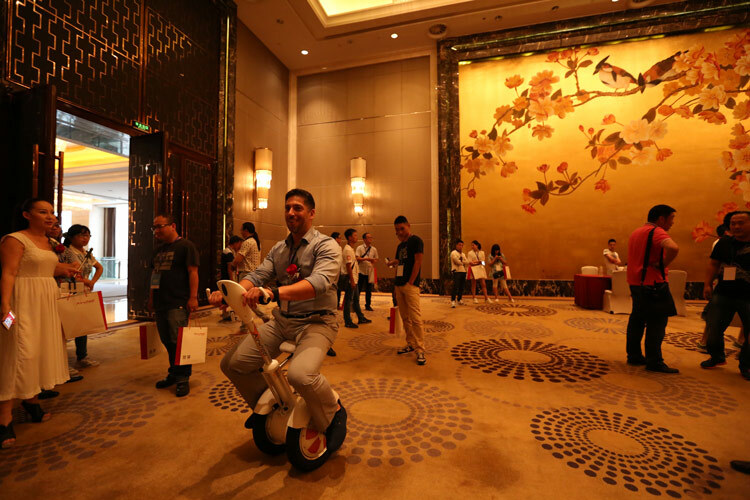 On this day, the electric scooter A3 and another new product were released at the Airwheel product launch press conference. The intelligent self-balancing scooter A3 appeared as if it were born to cause a sensation among the scooter industry. With the saddle, riders don’t have to keep standing during the ride. Instead, they are able to sit on the saddle while putting their feet on the scooter board and hands on the handlebars. They won’t feel tired no matter how long they have ridden. It is known that the riders would become exhausted for a long ride since the scooters before were all designed with standing-posture mode. Thanks to A3, this problem won’t happen again. Powered by the lithium-ion battery imported from Sony, A3 is endowed with a large power capacity and a long range. Having been fully charged, it can travel as far as 40 to 50 km. Therefore, it serves as a perfect vehicle for long-distance urban trip. Due to its energy-saving feature, it only consumes 1 kWh for 50 km. On that account, A3 appears as such a cost-effective vehicle that it only costs 0.5 euro for that distance in Europe. Without any doubt, the electric scooter A3 is about to take over the market in the near future for its convenience, high cost performance and eco-friendliness. Perfect as A3 may sound, consumers still hold some qualms about the vehicle that it might be powered off out of sudden during the ride. As a matter of fact, they can be completely assured. Generally, the battery of A3 is powerful enough to support a long-distance trip for riders. What riders need to do is check the battery condition from time to time. Moreover, an outdoor charging device for batteries is under development by Tesla, a reputed smart car manufacturer in the globe. Hence, the riders won’t need to worry about the power issue, for there will be more and more power stations for scooters soon. It is indicated that Airwheel scooter A3 is having a bright future ahead. The appearance of Airwheel A3 has uncovered a new chapter of the scooter development, which will definitely embrace even more ground-breaking features and improvements. The era of A3 is approaching in the near future.